The December QRP outing was planned for Dec. 17th, a Saturday. I wanted to test my "fortitude" for snow camping with an overnight at the BearFort Fire Tower site. See some of my previous posts to this site. It is close, about 15 mins from my house, and therefore very convenient. 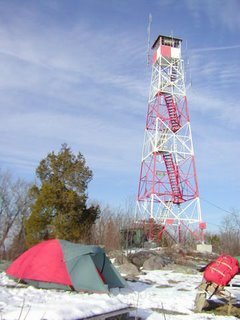 I retrieved my 4-season Jansport Mountain tent and heavy down sleeping bag and was planning for a cold night at the tower. The overnight temps were in the single digits recently but the weather has been clear. Fortunately, the forecast was for temps in the mid-teens, no wind, and clear skies. Sounded about as good as it was going to get for this time of the year! So the go-forward, green light was still on! It had snowed about a foot a week earlier and much of this snow was still present. So for sure it would be an overnight in the snow and with a full moon expected, the "ambiance" should be spectacular! I parked at the fireroad gate about 2pm or so, loaded my 45# pack and started the trek up to the tower. The road was snow covered but the hike in was easy. It took about 30 mins due to my heavier pack (normally with my daypack it takes about 15 mins) and my desire not to overheat/sweat up and create an over chilling problem. I quickly set up the tent in a nice level spot. (See picture) then put up my multi-band dipole with one end hanging of the fire tower and the other in a tree 200' away. The average antenna heigth was about 35' or so. With the sun setting at 4:30, it was starting to get cold with temps around freezing. I started out on 40m but due to RTTY and the RAC contests, the cw portion of the band was a nightmare. Out into the cold to switch the dipole over to 30m. Brrrr! It was cold outside. My thermometer was showing about 25-degs. I had 3 candles going inside the tent which kept the temp inside around 35-degs or so. I had plenty of clothes on, hats, gloves, etc. so I wasn't really cold but had to frequently warm my hands over the candles to keep them reasonably warm! I made a number of cw contacts on 30m before the band started getting very long around 9 pm. Temps were in the low 20's by now. It was time to hibernate into the sleeping bag. The only problem was I had to go to the bathroom. So I crawl out of the tent, admire the full moon, and back into the tent. When the temps are in the low 20's, this whole process is a challenge to say the least. Mental note to self: minimize liquid intake in the afternoon to minimize the output in the evening! Unfortunately, this process had to be repeated several more times during the night, the last a about 3am when the temp was in the mid-teens. COLD!!!! Fortunately there was no wind! The next morning was overcast. The inside of the tent was filled with condensation ice crystals from my breath. Jarring the tent caused a snow storm! Really cool. There was no morning sun to warm the tent! I turned on the K1, made 3 cw contacts, and then it was time to pack up and get some coffee and get warm!! Overall, I was dressed warm enough and stayed plenty warm in the sleeping bag. Next time, I will bring the white gas stove and have more heat for the tent and some tea water for a morning warm up cup.